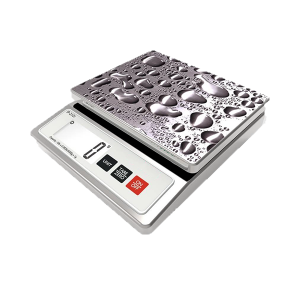 The Chilli Scale system lets you weigh ingredients using industrial weighing equipment. Production managers can identify which Works Orders are to be weighed on each scale and the operators can select the ingredients and the batches. Chilli Scale checks the weight of ingredients as they are added. The operator can use the touchscreen or the industrialised, food-safe keyboard and tracker ball. Chilli Scale brings information about safety equipment, allergens and batch life to the operators. 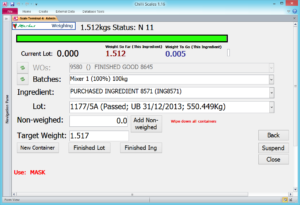 Production managers can see immediately which batches are being weighed and which are ready for the mixers or cookers. Chilli brings a new level of batch traceability to food production and Chilli Scale adds even more accuracy. Chilli Scale connects to Stevens and other scales using the standard serial interface and shows operators in a simple progress bar how much of each ingredient is required. Ingredients can be added from both pre-weighed packs and from loose, open packs.